Intel’s smart factories use highly specialized Internet of Things (IoT) data specifications that make it possible to bring new factories online quickly and reliably by replicating identical processes from one facility to another. Imagine being able to do the same thing with other buildings, such as offices and airports. These buildings present different challenges than manufacturing facilities ...because, rather than data-based measures, they often use performance-based measures that can vary, such as green—or sustainability—certification. Without highly defined data specifications individual suppliers may be unaware of integration requirements between automated components, resulting in costly delays and rework. 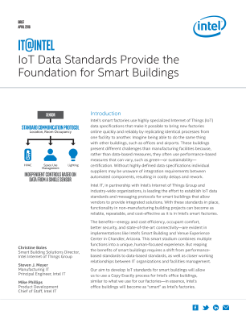 Intel IT, in partnership with Intel’s Internet of Things Group and industry-wide organizations, is leading the effort to establish IoT data standards and messaging protocols for smart buildings that allow vendors to provide integrated solutions. With these standards in place, functionality in non-manufacturing building projects can become as reliable, repeatable, and cost-effective as it is in Intel’s smart factories. The benefits—energy and cost efficiency, occupant comfort, better security, and state-of-the-art connectivity—are evident in implementations like Intel’s Smart Building and Venue Experience Center in Chandler, Arizona. This smart stadium combines multiple functions into a unique, human-focused experience. But reaping the benefits of smart buildings requires a shift from performance-based standards to data-based standards, as well as closer working relationships between IT organizations and facilities management. Our aim to develop IoT standards for smart buildings will allow us to use a Copy Exactly process for Intel’s office buildings, similar to what we use for our factories—in essence, Intel’s office buildings will become as “smart” as Intel’s factories. In this video, hear from corporate vice president of Intel's Enterprise and Government group who will share insights on emerging opportunities. AppFormix* experts discuss how running on Intel® Xeon® E5 v4 processors creates an more agile enterprise data center.